The former Army Radio Transmitting Building, at 107-207 Diggers Rest -Coimadai Road at Diggers Rest, is significant for its association with the US presence in Australia in 1942; with Australian Army's international radio communication during and after the Second World War; as an apparently rare surviving example of this type of building; and as the only significant wartime building remaining on the Army's Diggers Rest and Rockbank radio transmitting and receiving stations. The former Army Radio Transmitting Building at 107-207 Diggers Rest is historically significant at a LOCAL level (AHC A.4, B2, H1). The place is significant for its associations with the American wartime presence in Australia, and in particular, the presence of General Douglas MacArthur, Supreme Commander of Allied forces in the Southwest Pacific during the Second World War, in Melbourne in 1942. The Diggers Rest transmitting and Rockbank receiving radio bases were established for the USA military command in Melbourne during the crisis year of 1942. These radio bases are rare places developed in this very dark period of the nation's history, when Japan had invaded Australia's northern neighbours, and attacked Australia itself. As the war moved northwards after the naval battles of the Coral Sea and Midway and the defeat of Japan's New Guinea campaign, and as US troops began their Pacific island-hopping offensives, communications facilities also moved north, and by early 1943 the Diggers Rest and Rockbank bases had been vacated by the Americans and handed over to the Australian Army. This building, erected by the Australians in 1944, is the only significant wartime building remaining at either the Diggers Rest or Rockbank stations. Although it takes the form of the common portable prefabricated bow-roofed Nissen and similar styled huts built by British and American forces for wartime service, it is much larger than these standard buildings, and was customised to accommodate radio transmitting equipment (none of which remains). It may be an example of an 'Armco hut' manufactured in Australia during the Second World War. Although other examples may survive elsewhere, at this stage no other examples are known to have been definitely identified in Australia. 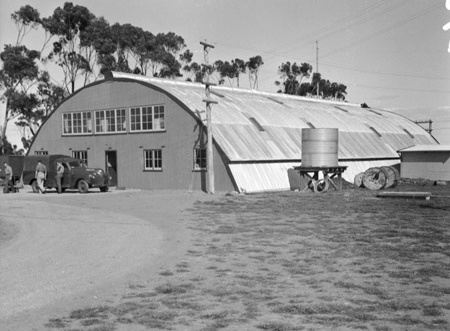 The building succeeded a woolshed that in 1942 the American signals unit had converted into a transmission station to link MacArthur with the United States and the Pacific military fields of operation. Built by the Australian Army in 1944, the building was used for communication with London (and possibly Moscow). By the war's end the building was the Australian Army's link with London and other Commonwealth centres in South-East Asia (Delhi, Kandy, Singapore and Welllington), and Rabaul in New Guinea. The building was also the lynch-pin of communication between the British Commonwealth Occupation Forces, handling all UK, NZ and Indian traffic between Melbourne and Japan (Kure). In the decades following the war, at least until the construction of a new transmission building in the late 1950s, the building was the Australian radio link with the 'British Commonwealth' (or 'Empire') Army Wireless Chain. This was a strategic radio relay network which linked the British War Office and Defence Ministry with Canada, East and West Africa, Ceylon, Singapore, Middle East, Japan, New Zealand and Australia. The building also played a critical role in international radio coverage of the Melbourne Olympic Games in 1956. The building is also expressive of the particular suitability, as found in comprehensive early surveys, of the Shire of Melton for international radio transmission and reception purposes. Its huge flat spaces, lack of radio 'noise' and trees, and uninterrupted proximity to Melbourne control centres made Melton prominent in early international 'wireless' ventures. The former Army Radio Transmitting Building at Diggers Rest is architecturally significant at a LOCAL level (AHC D.2). It demonstrates original design qualities associated with late interwar and postwar semi-cylindrial military huts. These qualities include the semi-cylindrical and bowed roof form that terminates at ground level, lapped galvanised corrugated steel roof and wall construction, regularly arranged flat rectangular skylights, horizontal bank of elevated windows and the timber framed double hung windows (arranged singularly and in pairs). The projecting flat-roofed porch also contributes to the architectural significance of the design. The former Australian Army transmitting building is situated on the south side of the Diggers Rest-Coimadai Road. It is a large Nissen hut style building, with an iron clad bow roof. The elevated, semi-cylindrical building is especially characterised by its bowed roof form that terminates at ground level. It is constructed of lapped galvanised corrugated steel,, punctuated by regularly arranged flat rectangular skylights. The end facade has a horizontal bank of elevated fenestration, with a projecting flat-roofed porch below. This porch has constructed in timber with timber framed windows. Flanking the porch are timber framed double hung ground floor windows, arranged singularly and in pairs. /nIts context is the former Diggers Rest Transmitting station, situated alongside a spacious Army personnel estate of c.20 cream brick houses, open space and tennis court, that would appear to date to the late 1950s and 1960s, with newish plantations of both natives and exotics. Situated some distance away are the c.1960s brick buildings of the later Army transmitting station. The adjoining paddock has piles of massive concrete blocks, presumably stay piles or foundations of former aerials. The former Diggers Rest Transmitting building is situated on the south side of the Diggers Rest-Coimadai Road. 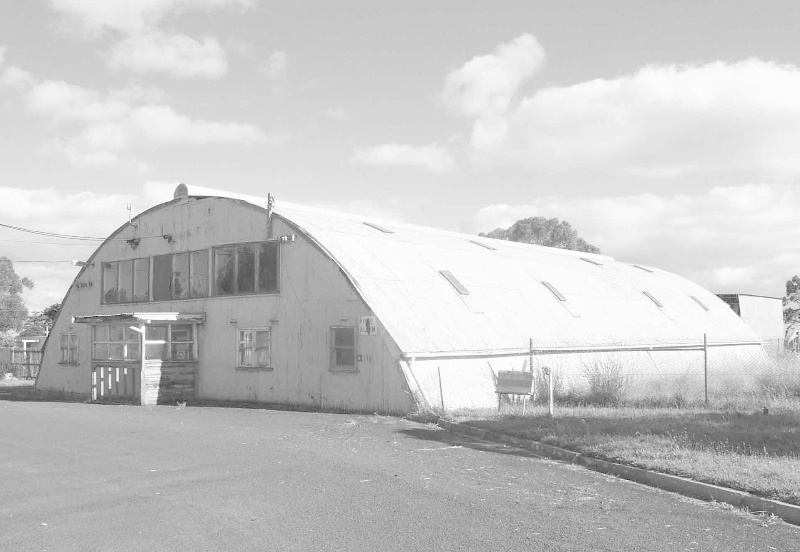 It is a large Nissen hut style building, with an iron clad bow roof. The elevated, semi-cylindrical building is especially characterised by its bowed roof form that terminates at ground level. It is constructed of lapped galvanised corrugated steel, punctuated by regularly arranged flat rectangular skylights. The end facade has a horizontal bank of elevated fenestration, with a projecting flat-roofed porch below. This porch has constructed in timber with timber framed windows. Flanking the porch are timber framed double hung ground floor windows, arranged singularly and in pairs.The station is situated alongside a spacious Army personnel estate of c.20 cream brick houses, open space and tennis court, dating from the late 1950s and 1960s, with newish plantations of both natives and exotics. Situated some distance away are the c.1960s brick buildings of the later Army transmitting station. The adjoining paddock has piles of massive concrete blocks, presumably stay piles or foundations of former aerials. 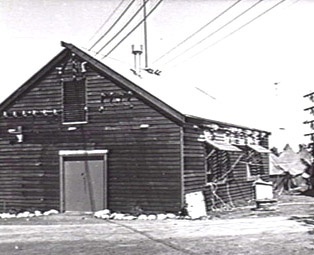 The former Army Radio Transmitting Building is significant for its association with the US presence in Australia in 1942; with Australian Army's international radio communication during and after the Second World War; as an apparently rare surviving example of this type of building; and as the only significant wartime building remaining on the Army's Diggers Rest and Rockbank radio transmitting and receiving stations.